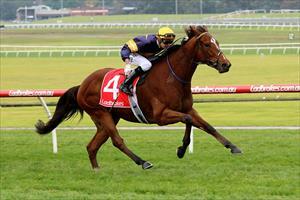 Three stable stalwarts represent the team at Flemington on Saturday and the welcome rain will assist their chances. War Legend (pictured) is the first to go in race six, the Darren Allsop Handicap over 2000m with James Winks riding and jumping from barrier 12 in the field of 16. Mike Moroney was counting on the forecast rain to arrive to help War Legend. “I was concerned about a firm track with the conditions we’ve been having and the wind drying everything out,” Moroney said. “Fortunately we’ve had some rain and the track is edging into the soft range. “I’m happy to run him despite the wide draw. His work has been good and he looks terrific - the brightest he’s looked this prep. Barthelona is in race eight, the Damian Cubela Handicap over 1400m, jumping from barrier eight with Chris Parnham in the saddle. The five-year-old has had no luck at his past two starts and Moroney is looking for a change in fortune. “The scratchings have helped as has the rain,” Moroney said. “I can’t fault him, he’s deep into this preparation but holding his preparation extremely well. Strike Force rounds out the day in the last race, the VRC Members Handicap over 1700m with Patrick Moloney to ride. He too had no luck at his last start and has drawn the outside on Saturday. “He’s drawn the outside but he has enough speed to get across and get a spot somewhere,” Moroney said.